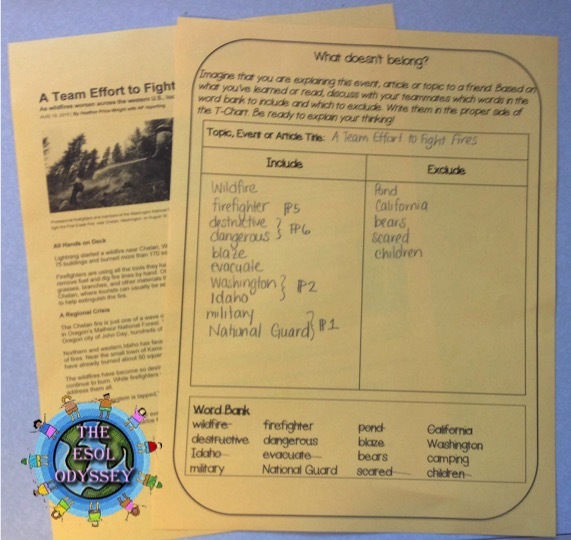 This strategy is perfect to get students thinking critically about an event, concept or topic they are studying. It also provides opportunities for students to engage with peers, and to practice in multiple language domains. First, create a list of words that appear in the reading you are using or that have come up as you’ve been learning about a particular event or topic. Include some words in the list that don’t belong, as well. Divide students into small groups or pairs and provide each group with a list. Students should work together to identify the words that belong and separate out the words that don’t belong. If they struggle with figuring out what belongs, ask them to choose which words they would use if explaining the event, idea or topic to a friend- these go in the “include” column. Any words they wouldn’t use in an explanation would go into the “exclude” column. It a chance for students to explore both content and the vocabulary related to it while incorporating higher-order thinking skills like synthesizing and justifying. As such, this activity makes a great warm-up review of previous learning, a wonderful pre-assessment, or an excellent post-reading activity. Close with a whole-group discussion on why certain words should or should not be included. Wonderful idea!!! Especially for my special Ed students!! !thank you!! !